Here's a little gospel interlude. Y'all know how I feel about my old school gospel. This is "I Made It" by the incomparable Clark Sisters. Writing about race and issues of equity during the Paula Deen scandal and the Zimmerman trial was challenging to say the least. To have to put on my intellectual hat while my heart was hurting was a tough feat. I'm fasting from the news right now because I just can't take it. 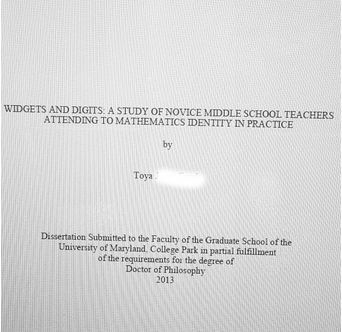 I submitted my dissertation late Monday night. It wasn't perfect, but I'm proud of my work. As my advisor has told me for years, "Perfect is the enemy of good." I remember when I decided to blog on a regular basis earlier in the year, I was so uncertain about the whole process. I was so close, but felt so far away. I keep staring at the document because I'm amazed at myself. Not that I didn't think I could do it, just that I did it. It takes some smarts to write a Ph.D., but more than that, it takes tenacity. My dissertation journey has not been easy. I've gotten married, moved, buried loved ones, supported numerous loved ones through their health issues, learned how to be a wife (and still learning), lost my doggy, and added a new one. There's one final step - the defense. Besides graduation day, it's the day that I've been dreaming about since my first day of doctoral classes. It's July 29th. I'm a little nervous, but I'll be fine. If you read this blog, be sure to lift me up in you prayers, meditations, chants - however you get it done, think about little old me. I'll be back before the defense; I just wanted to drop in on my favorite little place on these interwebs. Until next time . . . I'll be over here putting my dissertation defense presentation together! A Little Housekeeping: Following the Blog!